So did you take a guess at Friday’s picture? It was the Cosmopolitan hotel in sunny Las Vegas. We just spent last Friday night thru Wednesday there (in Vegas - not this particular hotel) and it was pretty great! I’m very happy to say that I have been there, seen it, checked out most of the hotels on the strip, had a few decent (but mostly overpriced) meals, and walked away having won just a little bit of cash! But not quite enough to quit my day job. Or actually to pay for a full tank of gas for that matter! But I still won and that’s what is important! I don’t know if you noticed just how blue the sky was in that picture – if not, you should go and take another look. It was gorgeous! We obviously don’t mind the heat and with little humidity it was pretty awesome. It was super sunny the whole time we were there too - and I was there with my sunscreen on and my fake (organic), spray tan! And we all know how important it is to take care of our skin – especially when it comes to sun care. The company I’m going to tell you about tonight was started “to create safe yet effective skincare for women 35+ because this is the age when many women first start to develop health issues resulting from an accumulation of toxic chemicals in their bodies that come from years of exposure to dangerous synthetic chemicals in the cosmetics and personal care products we use.” The founder and CEO of La Isha told me that in our correspondence. While I completely agree with the fact that it is vitally important to take care of our skin, I slightly disagree with it starting at age 35+. I am a child of fair skin and many sunburns. Many more than I would like to admit. And sadly I have been affected by this mistreatment of my skin already and I’m not at the 35 year age mark yet….I still have a few years to go. I see so many younger girls that are being affected by tanning beds and sun worshipping that I wish we were all told more about it when we were younger. It was oh so important to have that wonderful glow for prom that we would all go tanning for months before. I think girls (and maybe even the guys) need to get more information while they are younger. But regardless of the age, and my stand point on all of this – I think this is a great company and I don’t think that if you aren’t 35 yet – that should keep you from checking out and trying some of the La Isha products. 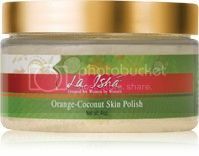 The products that La Isha offers cover everything from anti-aging, dry skin, and sun damage to breast health items. “Our holistic approach to timeless beauty integrates clinical essential oil therapy, international research on pomegranate seed oil, traditional plant lore, aromatherapy and ayurvedic principles for visually stunning results that support good health. All La Ishá skin care is made on demand from fresh, natural and organic ingredients that safely combat, repair and soothe dry, prematurely aging and sun-damaged skin. The entire line is free of synthetics, fillers, artificial colors, chemical fragrances, phthalates, parabens, sulfates, petroleum derivatives and known cancer-causing agents." Overall, another great company and I invite you to check out their website for more information. The story about how La Isha was started is pretty amazing. Sharon – I’m so happy to see that your son is doing so well and that he has been able to recover fully with no reminders of that horrible experience. Thank you for allowing me to tell my readers about your company! Writing requires putting thoughts on paper in a exciting way. in this blog you have performed a incredible paintings. you are noted the every thoughts in this submit. The writing structure and the sentences are clearly astonishing. Thank you for this amazing publish. Refer custom essay writing service to get help of professional writers in assignment.